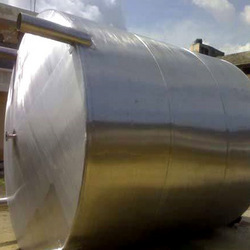 Prominent & Leading Manufacturer from Ghaziabad, we offer stainless steel tanks. We specialize in manufacturing and exporting a sophisticated range of Industrial Stainless Steel Tanks with sturdy body. Made in compliance with the industry standards, our range is specifically designed to meet the processing and storage demands of numerous industries. Clients use our range along with the boilers or other independent water heating sources. This enhances the storage capacity and efficiently meets the demands of peak and normal systems. Clients appreciate our range for being highly durable and maintenance free. This highly appreciated range strictly confirms to the dairy, food and pharmaceutical hygiene standards. Looking for “Stainless Steel Tanks”?